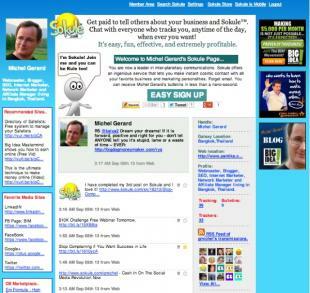 There are many advertising opportunities for your online business on the Internet. When you find a new source of traffic in a new advertising venue, you wonder where it has been hiding all the time. Today, I’d like to introduce to you SOKULE – Social Media For Business. Click the image above to see the real page. As soon as I discovered SOKULE I wanted to write a blog post about it. As there are so many features I decided to wait a week so I can get my hands on it and test different things. I admit that after signing-up I was a bit at lost with all the good stuff… They also have specific terms that you have to get familiar with. SOKULE is Social Media For Business: this means that you use the tool not only to socialize with others but also build your business. How many times have you had your paid FaceBook advert declined? This will not happen on SOKULE. As soon as you are using it, you will understand the value of what it can do for you to promote your online business. Social Media For Business – What Can SOKULE Do? There are different levels in SOKULE depending on your membership type: Free – Bronze – Bronze Plus – Silver – Gold – Founder. Today, I will only explain what you get with the FREE Membership. You can put up a short bio about yourself. You can include a live link to your site. You can make 140 character posts that instantly appear on Twitter. You can use the Sokens (credits) tool to get followers. You can use the birthday card tool to build relationships. You get 5,000 Sokens (credits) when you sign up. You get 25 Sokens (credits) when someone signs up under you at Sokule. You get two affiliate pages you can advertise and earn from. You earn 20% commission when someone you introduce to Sokule upgrades under you. A free member’s page at Sokule looks like this. Yes, you read correctly, 20% commission. Do you get that with Twitter? SOKULE is free to join. I really advise you to sign-up for this Social Media For Business platform, see by yourself what it can do, and when you begin to understand its enormous power, then consider upgrading. I personally upgraded right away at sign-up with the OTO. I have the Bronze-Plus Membership at $39.90 per month, instead of the regular $49.95. Take it if you can! Have fun with this innovative Social Media For Business.